This week I’ve enjoyed spotting some of the first signs of spring in our garden, and the peace before the chaos of half term next week. Wish me luck! We’ve also had time for a few frugal things this week, from flowers to freebies and bank account opening. 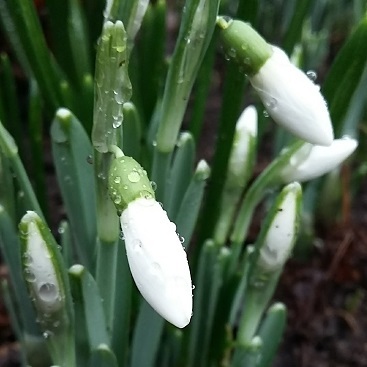 After the bleak winter weather, I was delighted to spot the first snowdrops to flower in our garden. It seems so long since there has been any colour amidst the browns, blacks and greens under grey skies. 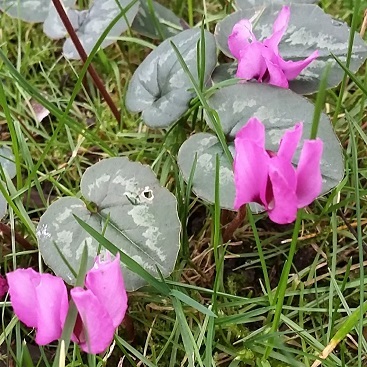 Since then I’ve spotted a few tiny flashes of pink, from cyclamen at the edge of the lawn, some tentative yellow primroses emerging in the front beds, and delicate white daphne flowers (or at least I think it’s daphne) on a bush at the back of the house. As the days lengthen, and the light lasts longer, I’m enjoying these signs that spring is on its way. Enjoying our garden, and the Suffolk landscape, is such a wonder and all completely free. If you’d like to see more pictures, I post a photo of a flower a day over on Instagram – do come over there and follow my feed. This week I was excited to get a parcel in the post (easily pleased, me) with a free book from the Mumsnet Book Club. If you sign up for their book club emails, they often do book giveaways. All you have to do it fill in your details, keep your fingers crossed, and then leave a brief book review if you’re lucky enough to win a copy. 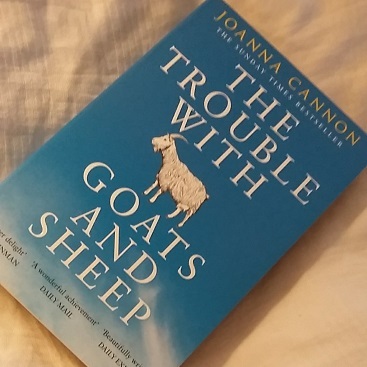 I’m really looking forward to reading “The Trouble With Goats and Sheep” by Joanna Cannon. One of the reviews on the cover describes it as “A quirky, moving and beautifully written tale of life in 1970s Britain”, so I’m looking forward to wallowing in nostalgia from my own childhood. I do worry that my children watch too much TV, but sometimes it does actually inspire them to do something else instead. Chopsticks were pressed into action as wands when shouting spells, post Harry Potter viewing, and the sitting room got taken over by a blanket tent after we went to see Swallows and Amazons. My daughter used part of her Christmas money to buy a Laika DVD boxset – Coraline, Paranorman and The Boxtrolls* – keen to point out that £7 was a good deal for three films. She was remarkably unmoved by the whole “buttons for eyes” storyline in Coraline that freaked me out, but was very taken by Coraline’s mini-me rag doll, and announced that she would like to make her own. Rather than rushing out to buy materials, I unearthed some possibilities from my fabric stash and dug out a bargain £2.99 book about doll making* that I got ages ago. 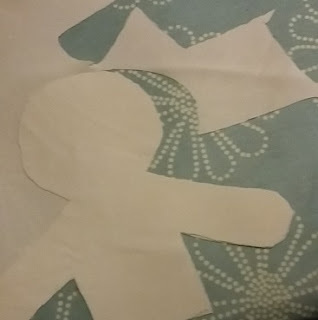 My daughter decided to use some of the silk left over from my wedding dress and traced a pattern ready to cut out the pieces. She’s now part way through sewing it up, and hopefully we can finish the doll, stuffing, button eyes, clothes and all, from things we already have in the house. I’m not always the biggest fan of money-off vouchers, as they tend focus on branded food. Often, even after you’ve used a voucher, the product is still more expensive than if you’d bought an own brand alternative. It feels like you’re nabbing a bargain, but actually you end up spending more than you need to. However, I do like vouchers where you get something completely free, and last Sunday when we went to Morrisons I remembered to use a combination of vouchers sent by post, email and via supermarket cashback apps. I used one of the Rachel’s Organic vouchers I blogged about before to get a free pot of their £1.84 low-fat rhubarb yogurt. I also claimed the £2 cost of a box of 24 Weetabix via TopCashback’s Snap & Save. The offer is still valid through Sunday (12 February) if you get a shimmy on. I also lashed out on some no added sugar Ribena, but took advantage of a 50p off voucher from a Change4Life email, plus another 25p off via the TopCashback mobile app. 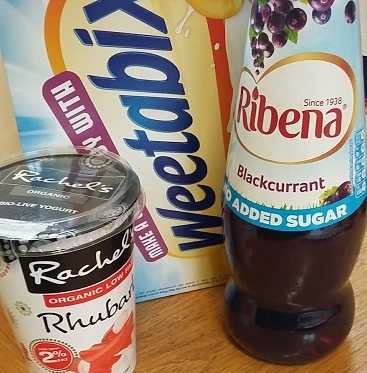 It’s hard to justify the Ribena, as I could have bought a perfectly good litre of Morrisons no added sugar blackcurrant high juice squash for £1.36, rather than the £1.73 the 850ml Ribena cost me after discounts, but it cheered the children up. I’m still keen to earn as much interest as possible on our savings, even if it’s tricky when rates are so rubbish right now. Current accounts seem to be one of the few places where you can earn slightly higher interest, albeit on limited amounts. Last Saturday I got round to setting up yet another current account, this time with Bank of Scotland. I applied online and ticked the “Vantage” box, which means I can earn as much as 3% on balances up to £5,000. I’ll happily pocket an extra £150 a year, especially when the new Personal Savings Allowance means basic-rate taxpayers can earn £1,000 a year in interest without paying a penny in tax, and even higher-rate taxpayers can earn £500 a year tax-free. The good news is that you don’t have to switch your current account to benefit and there’s no acccount fee, but you do need to pay in £1,000 a month and pay at least two direct debits every month. For details of other high interest current accounts on offer, check out my post here. Once the computer generated my account number and sort code, I was able to tweak the standing orders that move money round between our different accounts, so that £1,000 will be paid into the Bank of Scotland account every month. 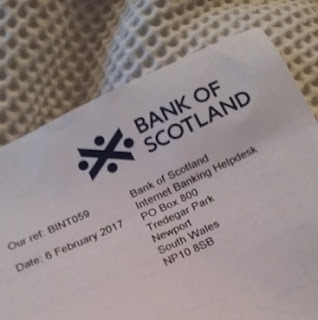 The letter with my internet banking code showed up yesterday, so I’ve now been able to set up a standing order to transfer the money out of Bank of Scotland a few days later, and back into our main current account. I was also able to check that the £1 test payment I did on Saturday showed up in the right place, and then transfer more of our savings. The direct debits are slightly trickier. I prefer to pay most of my direct debits from my Santander 123 current account, as it pays cashback on household bills that covers the fiver-a-month fee. Instead, I’ve changed our direct debit details on the TV licence website, so it will now go out of the new Bank of Scotland account, and I’ve also set up a pound-a-month direct debit to Shelter. It may be a minimal contribution, but it meets the account criteria, and I know the money will go to a good cause. Hopefully as it’s an automated payment it won’t cost the charity too much to adminster. I’ve written this all out because although it may sound a bit complicated, once you’ve set it up, everything happens automatically and you can just sit back and pocket the interest. So that’s my round up of five frugal things this week. Now over to you – any thrifty successes to celebrate? I’d love to hear! *indicates an affiliate link, so anything you buy through them will help support the blog, as I will get a small commission, at no cost to you. Many thanks! Next Post Get fit for less: be careful what you wish for! Thanks Becky! I really enjoyed making stuff myself as a child (still do, given half a chance) so I'm been hoping my daughter might be interested herself. Fingers crossed… Should think of my son too, he's been doing a bit of cross stitch after he was inspired by making a blowfish hand puppet at school. Spooky indeed. I love rag dolls – still have one I made myself as a child. Fundamentally, companies offer vouchers to encourage us to buy more stuff, so I try to be wary if I'm keeping to a budget. Do wish we had an Aldi nearby too! Sounds like a good week – nice boost to your savings balance too! Thanks Katy. One of my regular saver accounts ended after a year, so I've been trying to find a good home for the cash.